It was a big decision for me to go back and run Comrades again this year. I last ran this 90K ultra marathon in 2012 - the Down Run - with my brother Ian. You can read my blog about the event here. For those you who don't know it, Comrades is the oldest and biggest ultra marathon in the world with a wealth of history behind it. The direction of the 90K route alternates each year between the Up Run (Durban to Pietermaritzberg) and the Down Run (Pietermaritzburg to Durban). Both directions are particularly challenging with over 2000 feet of climbing. I had such an amazing experience and ran so much better than I had ever hoped I would on that day in June 2012. 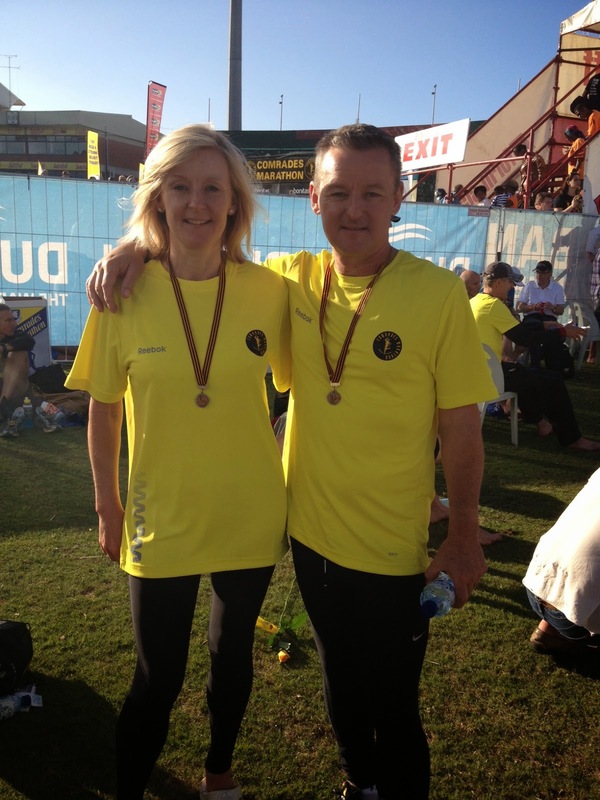 My training had been injury free, I felt fit and well and up for the race and I had my experienced older brother to support me on the route (he's a Comrades Green Number holder, having completed 12 so far). Even the weather was kind (well, to start with anyway) with a cooler, overcast start for those early hours coming out of Maritzberg. I had set my hopes on a Bill Rowan medal (sub 9 hours finish time) and was therefore surprised and delighted to cross the finishing line in Durban's Kingsmead Cricket Stadium in 8 hours, 9 minutes and 25 seconds - incidentally, only a couple of minutes behind the great Zola Budd and former multiple race winner Bruce Fordyce! And the icing on the cake was winning my age category (something I refused to believe for quite a while when my sister texted me immediately after the race). It's a common saying amongst ultra runners that you are not a 'true Comrades runner' until you have completed both an Up run and a Down run. Always up for a challenge, I entered again in 2013 for the experience of the Up. Unfortunately, after a couple of months of training through a hard winter I was diagnosed with a stress fracture of the calcaneum (heel bone) and reluctantly pulled out. Hence why I am going back this year - it's unfinished business! Whether or not I perform as well as I did 3 years ago remains to be seen. I am 3 years older and the challenge of the Up is uppermost in my mind. I'm not a great hill runner yet I can't avoid the notorious climbs of this route - the first 40K is uphill! I will let you know how the training goes, the big event itself and the recovery. Stay tuned!